Find terms for Canada further down on the page. Below text is applicable for the United States. This limited warranty covers defects in materials and workmanship of PanzerGlass products (the “product”) for the Warranty Period described below. PanzerGlass (“we”) extends this limited warranty only to the individual consumer who originally purchased the product (“you”). It does not extend to any subsequent owner (for example, if you sell the product, the buyer cannot obtain warranty service). We warrant that during the warranty period, the product will be free from defects in materials and workmanship (including everyday wear-and-tear, scratches, shattering, chips, cracks, failing adhesive, discoloration and bubbles in or on the product). This limited warranty does not cover any damage due to: (a) improper use; (b) device upgrades, repairs or replacements that impair the functioning of the PanzerGlass product; (c) improper installation; (d) failure to follow the product instructions; (e) modifications; (f) unauthorized repair; or (g) abuse or misuse of the product. This limited warranty starts on the date you first began using the product and lasts for as long as you own the device for which the product is purchased (the “Warranty Period”), or the replacement/repaired product. If you discover a defect before you use the product (such as such as discoloration, faulty silicone adhesive, warping, rainbow line discoloration, scratches, oil marks or impurities in or on the product), please return the product to the retailer where you purchased it. With respect to any defective product during the Warranty Period, we will, in our sole discretion, either: (a) replace such product (or the defective part) free of charge; (b) provide a product of comparable value; or (c) provide a credit to purchase a different PanzerGlass product. You must pay for shipping and handling fees to return the replacement product to you if we elect to replace the defective product. To obtain warranty service, please submit a warranty claim through www.warranty.panzerglass.com by providing the product’s serial number, a copy of the original receipt, and a photo of the defective PanzerGlass product. All warranty claims are subject to approval by PanzerGlass, which may reject warranty claims in its reasonable discretion. You will be required to provide a valid credit card number in order to pay a shipping and handling fee (between $5.99-$9.99 USD). The shipping and handling fee will not be charged to your credit card until PanzerGlass has approved the claim. This limited warranty gives you specific legal rights and you may also have other rights, which vary from state to state. Some states do not allow the exclusion or limitation of incidental or consequential damages, so the above limitation or exclusion may not apply to you. Below text is applicable for Canada. To obtain warranty service, please submit a warranty claim through www.warranty.panzerglass.com by providing the product’s serial number, a copy of the original receipt, and a photo of the defective PanzerGlass product. All warranty claims are subject to approval by PanzerGlass, which may reject warranty claims in its reasonable discretion. You will be required to provide a valid credit card number in order to pay a shipping and handling fee (between $7.99-$12.99 CAD). The shipping and handling fee will not be charged to your credit card until PanzerGlass has approved the claim. THIS SECTION DOES NOT APPLY IN THE PROVINCE OF QUEBEC. This limited warranty gives you specific legal rights and you may also have other rights, which vary from jurisdiction to jurisdiction. Some jurisdictions do not allow the exclusion or limitation of incidental or consequential damages, so the above limitation or exclusion may not apply to you. You have agreed that this limited warranty and all related documents be drafted in English. Vous avez demandé et convenu que la présente et tout document y afférent soient rédigés en anglais. 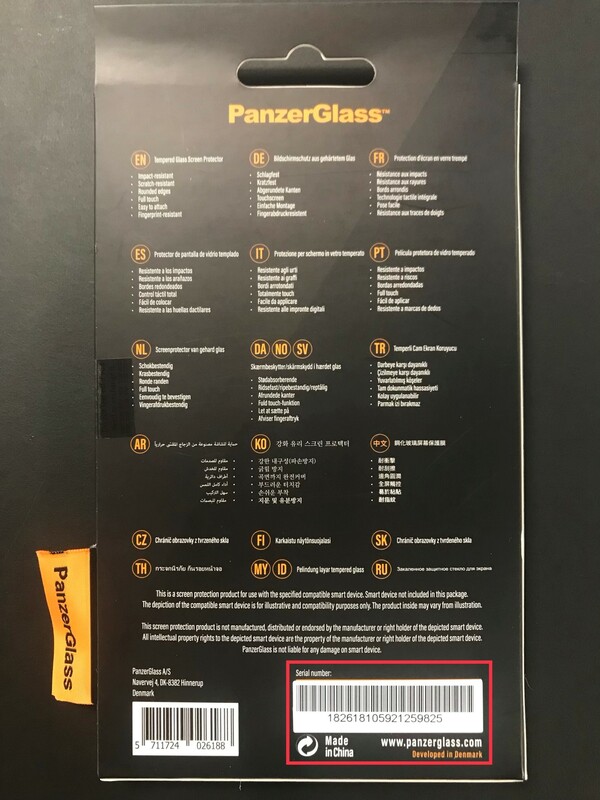 Proof of purchase, to validate that the product is an original PanzerGlass, and was purchased from an authorized reseller, is required to be covered by the PanzerGlass Limited Lifetime Warranty. If you did not find your answer above, please contact warranty@panzerglass.com. For more information on our warranty policy, please go to http://panzerglass.com/warranty. This Privacy Statement describes the type of information that PanzerGlass (“PanzerGlass” or “we”) collects through your use of our warranty platform, www.warranty.panzerglass.com (the “Warranty Platform”). This Statement does not apply to information collected about you through any other means, including information collected on the main PanzerGlass website, or information collected by third parties or through non-electronic or offline means. · What personal information is collected by PanzerGlass through our Warranty Platform. By accessing or using the Warranty Platform, or by clicking the “accept” button when you register to use a Service, you consent to our use of your personal information as described in this Statement. This Statement may change from time to time. Your continued use of the Warranty Platform after we make changes is deemed to be acceptance of those changes, so please check the statement periodically for updates. We collect information from you in two ways. First, you provide us with certain information when you use our Warranty Platform. Second, we collect certain information automatically as you interact with our Warranty Platform. · Payment card information. Our third-party payment processor collects payment card information to cover return shipping and handling charges. The information we collect automatically is statistical information and may include personal information, or we may maintain it or associate it with personal information we collect in other ways or receive from third parties. If you do not want us to collect this information, do not use the Warranty Platform. · for any other legal or business purposes that are not inconsistent with the terms of this Statement. We may also combine information we collect about you through the Warranty Platform with other information about you that we receive through other means or from third-party sources. The Warranty Platform is not intended for users younger than 18. We do not knowingly collect contact information from children under the age of 13 without verifiable parental consent. If we become aware that a visitor under the age of 13 has submitted personal information without verifiable parental consent, we will remove his or her information from our files. We may change this Privacy Statement from time to time. If we decide to make a material change in our Privacy Statement, we will post it on this page. Your continued use of the Warranty Platform after we post changes to this Privacy Statement will signify that you accept these changes. In some cases, we may attempt to contact you through an email or other address you have provided, so we can give you choices about our using your information in a manner different from that stated at the time of collection. If we make any material changes in our privacy practices that affect your personally identifiable information that is already in our possession, we will apply those changes to that older information only with your consent or as otherwise allowed by law. If you have any questions about this Privacy Statement or our use of the information we collect from you in connection with the Warranty Platform, email us at warranty@panzerglass.com. We reserve the right to change this policy from time to time as industry practice, the law, and our procedures in this area may change from time to time. We will post the current version of this policy at: https://warranty.panzerglass.com/. By accessing or using the Warranty Platform, or by clicking the “accept” button when you register to use a Service, you consent to our use of your personal information as described in this Policy. This Policy may change from time to time. Your continued use of the Warranty Platform after we make changes is deemed to be acceptance of those changes, so please check the Policy periodically for updates. If the changes are significant, we will provide a more prominent notice. If the policies and procedures outlined in this document do not address a specific situation, individuals are advised to contact PanzerGlass's Privacy Officer for guidance or clarification. We collect information from you in three ways. First, you provide us with certain information when you use our Warranty Platform. Second, we collect certain information automatically as you interact with our Warranty Platform. Third, we may collect your information from other persons with your consent or as authorized by law. Before or at the time of collecting personal information, we identify the purposes for which we are collecting the information. We do not provide this notification when personal information is volunteered for an obvious purpose. If we wish to use or disclose your information for a new purpose not included in this policy, we will notify you and seek your consent. Ordinarily we ask for consent to collect, use or disclose personal information, except in specific circumstances where collection, use or disclosure without consent is authorized or required by law. We may assume your consent in cases where you volunteer information for an obvious purpose. You may withdraw consent to the use and disclosure of personal information at any time, unless the personal information is necessary for us to fulfil our reasonable business or legal obligations. We will respect your decision, but we may not be able to provide you with certain products and services if we do not have the necessary personal information. From time to time, PanzerGlass may be compelled to disclose personal information in response to a law, regulation, court order, subpoena, valid demand, search warrant, government investigation or other legally valid request or enquiry. In these circumstances, PanzerGlass will protect the interests of its customers by making reasonable efforts to ensure that orders or demands comply with the laws under which they were issued, that it discloses only the personal information that is legally required and nothing more, and that it does not comply with casual requests for personal information from government or law enforcement authorities. We may also disclose information to our accountants, auditors, agents and lawyers in connection with the enforcement or protection of our legal rights. We also reserve the right to report to law enforcement agencies any activities that we, in good faith, believe to be unlawful or to law enforcement and emergency services providers, in an emergency or where required or permitted by law. We may release certain personal information when we have reasonable grounds to believe that such release is reasonably necessary to protect the rights, property and safety of others and ourselves, in accordance with or as authorized by law. Personal information will be retained only as long as necessary and as required by applicable legislation and securities regulations and will be disposed of in a manner that is appropriate to the sensitivity of the information. We render client personal information non-identifying, or destroy records containing personal information once the information is no longer needed. We use appropriate security measures when destroying client personal information, including shredding paper records and permanently deleting electronic records. We will notify the Office of the Information and Privacy Commissioner of Alberta, and any other Privacy Commissioners as required, without delay, of a security breach affecting personal information if it creates a real risk of significant harm to individuals or as required under applicable laws. We ask for your express consent for some purposes and may not be able to provide certain services if you are unwilling to provide consent to the collection, use or disclosure of certain personal information. Where express consent is needed, we will normally ask clients to provide their consent orally (in person, by telephone), in writing (by signing a consent form), or electronically (by clicking a button). To the extent authorized by law, in cases that do not involve sensitive personal information, we may rely on “opt-out” consent. The amount and type of personal information collected by PanzerGlass shall be limited to what is necessary to fulfill the identified purpose. Personal information shall only be used or disclosed for the purposes for which it is collected. Exceptions may be made with the consent of the individual or if authorized or required by law. Personal information collected by PanzerGlass or on behalf of PanzerGlass will be sent to PanzerGlass’s head office located at Navervej 4, 8382 Hinnerup, Denmark and will be subject to the laws of Denmark. Please note that we use cloud-based services to store information. Where personal information is stored or processed outside of Canada, it is subject to the laws of that foreign jurisdiction, and may be accessible to that jurisdiction’s governments, courts or law enforcement or regulatory agencies. Upon request received by PanzerGlass in writing, individuals shall be informed of the existence, use, and disclosure of their personal information records and shall be given access to that information. Requests to access personal information held by PanzerGlass should be directed to PanzerGlass's Privacy Officer. For contact information, please see section M, “Question and Complaints”. PanzerGlass responds to requests for access to personal information within thirty (30) days of receipt of the request, or as may be permitted in accordance with applicable privacy legislation. A fee for reasonable costs incurred may be charged when responding to more complex requests, if authorized by law. The individual will be informed of the applicable fee. Requested information will be provided in a form that is generally understandable. Individuals are permitted either to view the original record, or to request a copy, subject to limitations as permitted or required by law. To preserve the integrity of the record and ensure that documents are not removed from PanzerGlass, individuals wishing to view an original record will do so at PanzerGlass's head office and under the supervision of designated PanzerGlass personnel. PanzerGlass will only refuse access to information about you in those circumstances permitted or required by applicable privacy legislation. In the event that PanzerGlass refuses to provide access to information, it will provide you with the reasons for its refusal upon request. Exceptions may include information that contains references to or opinions of other individuals, information that cannot be disclosed for legal, security or commercial proprietary reasons, or information that is subject to solicitor-client or litigation privilege. PanzerGlass will respond to your requests for access in accordance with applicable privacy legislation. Individuals have the right to challenge the accuracy and completeness of the personal information that is maintained by PanzerGlass and have it amended as appropriate. Individuals seeking a correction or amendment to their personal information should direct their requests in writing to PanzerGlass's Privacy Officer, at matr@panzerglass.com. All formal requests to amend personal information must be accompanied by appropriate supporting documentation. PanzerGlass’s Privacy Officer will manage any exceptions. The amended information will be transmitted to third parties, as appropriate. If the individual is not satisfied with the results of the request, PanzerGlass shall internally document the issue, and provide a response. The existence of the unresolved challenge will be transmitted to third parties, as appropriate.